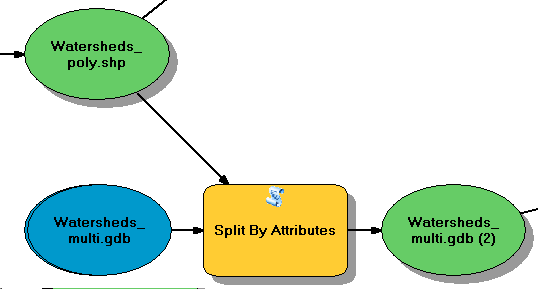 I want to create for each polygon of a shapefile a separate shapefile with the Split By Attributes tool. Input is a polygon shapefile and as split field I choose the ID. This tool works fine but in the results I cant find any shapefile, only .dbf , .dbf.xml and .cpg. But why is there no .shp? As output I tried a workspace and a geodatabase, both didn't worked. Your problem is that you use a Shapefile as an input. Your target workspace appears to be a file geodatabase, which means your output will be feature classes. Open the Target GDB in Catalog/ArcMap and you will see the split attributes as single Feature Classes. Should you really desire to output Shapefiles, you can add the Feature Class To Shapefile (Conversion) tool to your model. Not the answer you're looking for? Browse other questions tagged arcgis-desktop shapefile modelbuilder file-geodatabase split-by-attribute or ask your own question. Why does ArcGIS produce different file output types for the 'Split by Attributes' tool when using either ArcPy or the GUI? How to add iteration in model to join fields from several shapefiles into final one? Import UTF-8 encoded Shapefiles into SQL Server?